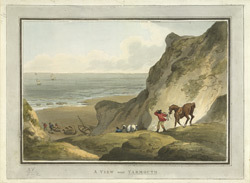 View of the coast at Yarmouth in the Isle of Wight. Yarmouth is situated on the western side of the Island at the mouth of the River Yar, and it is from this location that the name derived. The Celts were the first to settle here ad then the Romans. At this time it was known as Eremuth or Ermud which means ‘muddy estuary’. It was a Norman, Baron de Redvers, who built the first town here in the 12th century. The town was for a time quite important however it was surrounded by the River Yar, the Solent and wet marsh land so opportunities for the town to develop in size were limited.